Kozzmozz is very proud to welcome back one of its very first big head-liners ever, in a faraway past on a boat … Adam Beyer has always been a techno favorite and is definitely one of ours also. It has been a long time since we had the pleasure of his company and we are sure you won’t be disappointed. His Drumcode label is responsible for putting Sweden and a lot of talented producers as Cari Lekebush, Joel Mull, Jesper Dählback and more recently names as Paul Ritch, Alan Fitzpatrick and Joseph Capriati on the world-wide techno-map. 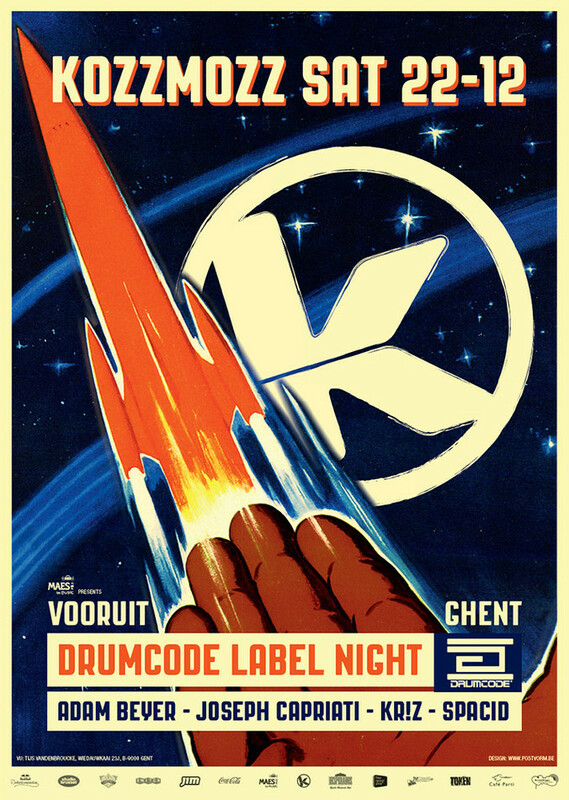 Having been active for over 15 years, Drumcode was as highly respected in the ‘90’s as it is now. Drumcode is actually more popular than ever with a constant flow of techno dance-floor killers. The label has just released their 100th EP and Adam Beyer shows no signs of slowing down. Next to running Drumcode, he regularly brings out own material on the label as well as sister labels True Soul & MadEye. He used to be found also on other labels as Plus 8, Novamute, Cocoon and Soma. These days most of his output is released on his own imprints. His remixes have touched material from names as Underworld, Mathew Jonson & many others. He mixed compilations for well established brands as Fabric, Time Warp and Music Man. As a dj. his diary is filled up with faraway places and the biggest festivals around on a weekly basis. He’s a true techno hero with an amazing ear for new talent. One of these newer talents is Joseph Capriati who’s first production in 2007 was an immediate stepping stone to the highest regions of the techno firmament. From there on, he found his way to Drumcode where he released several EP’s of which the latest one with the techno-boss himself. And he has second album on Drumcode in the pipeline for 2013. He recently remixed Cari Lekebush, Ben Sims, Mark Broom and the list goes on. He played a lot of big events as Tomorrowland and Monegros and staged parties as Total Drumcode in Berghain. Now he’s hitting Kozzmozz with all his force. These two heavy weights will be joined by our usual suspects. Kr!z from Token Records who’s latest EP from Inigo Kennedy is another techno monster conquering the world. And with the growing world-wide recognition of Token Records, also Kr!z’ dj schedule is filling up more and more with big foreign bookings. Spacid who’s been around since the very beginning will load up his favorite techno tunes of the moment for the occasion. Prepare for another high flight through techno hyperspace and fasten your seatbelts!